The limited-edition line also includes wrapping paper featuring a chicken and Colonel Sanders print. Kentucky Fried Chicken is letting you bring the Colonel home for the holidays with its limited edition “season-al” capsule collection. From Halloween costumes and dramatic paintings to a line of limited edition fashion line, Kentucky Fried Chicken has spent the year cooking up surprising additions to its e-commerce line. It’s wrapping things up with a holiday-themed collection of merchandise and apparel, the perfect way to prove to the chicken lover in your life you’ve been paying attention. This limited edition chicken swag covers just about every corner of the holiday gifting experience, from the personal to the casual gift, and right on down to what you wrap it in. 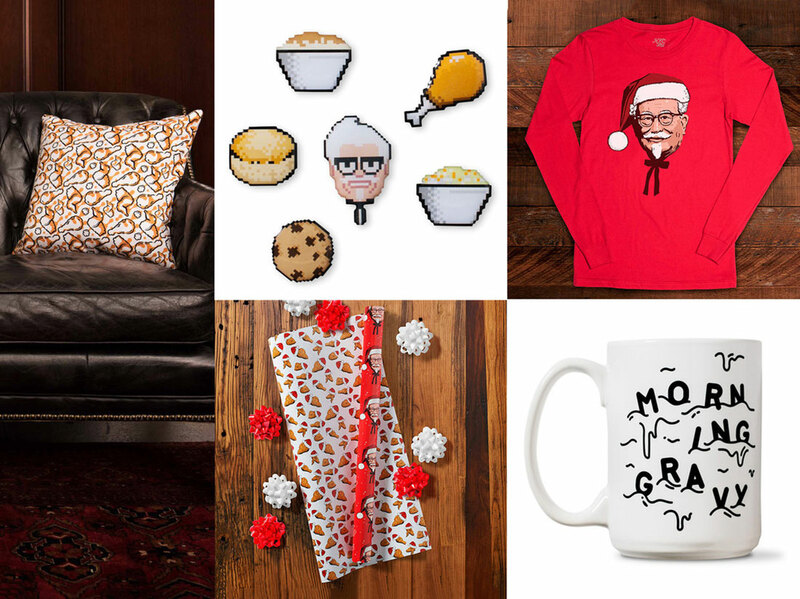 The capsule collection includes small stocking stuffers like an 8-bit pin collection and KFC-themed stickers, as well as vintage-style apparel, including a long-sleeved t-shirt that features “Colonel Santa,” the chicken chain’s answer to the classic ugly sweater. If someone you know is looking to update their home decor, there’s also a variety of plush velvety pillows, featuring chicken patterns and other vintage prints of the Colonel in the kitchen, at one of his restaurants and on a tractor. If you’re looking for a smaller, low-cost present for the office co-worker or the friend of a friend, you can try gifting them with something they can enjoy every morning. Replace that old boring old coffee mug with something a little spicier: The morning gravy mug. And to really show how much you or someone else cares about chicken, KFC has made a special gift wrap that you can smother your gifts in. The wrap is covered in drumsticks and the Colonel’s smiling face because why not? "Our finger lickin' faithful deserve to celebrate the holidays by giving and receiving some fried chicken essentials," said George Felix, director of advertising, KFC U.S. "The second round of KFC Ltd. has it all, even the wrapping paper. You'll spend less time shopping, leaving you more time to enjoy a $20 Fill Up with your family this holiday season." The gifts start at just $4, and like the last collection, KFC is only releasing a limited quantity. So you’ll have to act fast—before December 15 to be exact—to get your fast food gifts in time for the holidays. Check out the entire collection at kfclimited.com.